Kavala (Greek: Καβάλα, Kavála [kaˈvala]) is a city in northern Greece, the principal seaport of eastern Macedonia and the capital of Kavala regional unit. It is situated on the Bay of Kavala, across from the island of Thasos and on the Egnatia motorway, a one-and-a-half-hour drive to Thessaloniki (160 kilometres (99 miles) west) and a forty-minute drive to Drama (37 km (23 miles) north) and Xanthi (56 km (35 miles) east). It is also about 150 kilometers west of Alexandroupoli. In Antiquity the name of the city was Neapolis ('new city', like many Greek colonies). During the Middle Ages, it was renamed Christoupolis ('city of Christ'). The etymology of the modern name of the city is disputed. Some mention an ancient Greek village Skavala near the town. Other proposals include either from the Italian cavallo (= horse). Its nickname is The cyan city (Η γαλάζια πόλη). Worship of Parthenos / the Virgin, a female deity of Greek–Ionian origin associated with Athena, is archaeologically attested in the Archaic period. At the end of the 6th century BC Neapolis claimed independence from Thassos and began issuing its own silver coins with the head of Gorgo (γοργὀνειο) on one side. A few decades later a large Ionic temple made from Thassian marble replaced the Archaic one. Parts of it can now be seen in the town's archaeological museum. Neapolis was a town of Macedonia, located 14 km (9 mi) from the harbour of Philippi. It was a member of the Second Athenian League; a pillar found in Athens mentions the contribution of Neapolis to the alliance. The Apostle Paul landed at Kavala on his first voyage to Europe. In the 6th century, Byzantine emperor Justinian I fortified the city in an effort to protect it from barbarian raids. In later Byzantine times the city was called Christoupolis (Χριστούπολις, "city of Christ") and belonged to the theme of Macedonia. The first surviving mention of the new name is in a taktikon of the early 9th century. The city is also mentioned in the "Life of St. Gregory of Dekapolis". In the 8th and 9th centuries, Bulgarian attacks forced the Byzantines to reorganise the defence of the area, giving great care to Christoupolis with fortifications and a notable garrison. Bulgarians captured the city in 834 under Presian First of Bulgaria and held it until it fell in the hands of the Lombards in 1197. In 1302, the Catalans failed to capture the city. In order to prevent them from coming back, the Byzantine emperor Andronikos III Palaiologos built a new long defensive wall. In 1357 two Byzantine officers and brothers, Alexios and John, controlled the city and its territory. Excavations have revealed the ruins of an early Byzantine basilica under an Ottoman mosque in the Old Town. It was used until the late Byzantine era. The Ottoman Turks first captured the city in 1387 and completely destroyed it in 1391, as a Mount Athos chronicle testifies. Kavala was part of the Ottoman Empire from 1387 to 1912. In the middle of the 16th century, Ibrahim Pasha, Grand Vizier of Suleiman the Magnificent, contributed to the town's prosperity and growth by the construction of an aqueduct. The Ottomans also extended the Byzantine fortress on the hill of Panagia. Both landmarks are among the most recognizable symbols of the city today. In August 1916 rests of the IV Army Corps, stationed at Kavala under Ioannis Hatzopoulos surrendered to the advancing Bulgarian army. These events provoked a military revolt in Thessaloniki, which led to the establishment of the Provisional Government of National Defence, and eventually Greece's entry into the First World War. After the Greco-Turkish War of 1919–1922, the city entered a new era of prosperity because of the labour offered by the thousands of refugees that moved to the area from Asia Minor. The development was both industrial and agricultural. Kavala became greatly involved in the processing and trading of tobacco. Many buildings related to the storage and processing of tobacco from that era are preserved in the city. During the Interwar period and the Second Hellenic Republic, Kavala was the 4th largest city in Greece (after Athens, Thessaloniki and Patras). In 1934 Dimitrios Partsalidis was elected mayor of Kavala, the first communist mayor in modern Greek history. The city gained temporarly by the Press, the nickname "little Moscow". During World War II and after the fall of Athens, Bulgaria conquered the city. Almost the entire Jewish community of the city was exterminated during the Occupation. Following the years after WWII, the city faced economic decline and immigration. In the late 1950s Kavala expanded towards the sea by reclaiming land from the area west of the port. In 1967, King Constantine II left Athens for Kavala in an unsuccessful attempt to launch a counter-coup against the military junta. 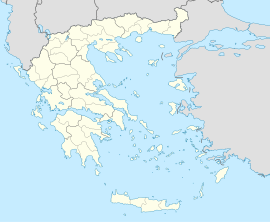 The province of Kavala (Greek: Επαρχία Καβάλας) was one of the provinces of the Kavala Prefecture. Its territory corresponded with that of the current municipality Kavala, and part of the municipal unit Eleftheroupoli. It was abolished in 2006. After the country's industrialization, Kavala also became a center of the tobacco industry in northern Greece. The building of the Municipal Tobacco Warehouse still stands today. Oil deposits were found outside the city in the mid-20th century and are currently exploited by an oil rig. Kavala has a humid subtropical climate (Köppen climate classification Cfa) that borders on a semi-arid climate (Köppen climate classification "BSk" or "BSh" depending on the system used) with annual average precipitation of 460 mm (18.1 in). Snowfalls are sporadic, but happen more or less every year. The humidity is always very high. The absolute maximum temperature ever recorded was 38.0 °C (100 °F), while the absolute minimum ever recorded was −16.1 °C (3 °F). The Technological Educational Institute of Eastern Macedonia and Thrace (Greek: ΤΕΙ Ανατολικής Μακεδονίας και Θράκης) is a public institute providing education at university level in the region of Eastern Macedonia and Thrace. The main campus of the institute located in St. Lukas, Kavala and is approximately 132,000 m2 with buildings covering an area of 36,000 m2.The campus is home to two faculties (Faculty of Engineering Sciences and Faculty of Business and Economics) with a total of nine departments. Fisheries Research Institute (FRI) is one of the five specialized research institutes of N.AG.RE.F, being responsible to conduct research and to promote technological development in the fishery sector. The institute is located 17 km (11 mi) from Kavala, in Nea Peramos, at the centre of a marine area with rich fishery grounds and high biodiversity in the surrounding lagoons, lakes and rivers. Institute of Mohamed Ali for the Research of the Eastern Tradition (IMARET) is a registered NGO with the Hellenic Ministry of Foreign Affairs, which was established by concerned citizens in Kavala. Its aims include the study of the Egyptian influence in Greece and vice versa. The intra-cultural exchange and dialogue, as well as the promotion of art as a means of intra-cultural understanding. The first major co-operation partner is Cultnat of Bibliotheca Alaxandrina with the aim of documenting and digitizing the architectural heritage of the Mohamed Ali era in Egypt and Greece. The most important event that takes place every year at the institute is the International Roman Law Moot Court Competition. Historical & Literary Archives of Kavala is a non-profiteering, public utility foundation. Its foundation was not subsidized by the Greek State, neither by any other enterprise of the private sector. Its operational cost is covered only by its founders and by infrequent aids of the local self-government. Egnatia Aviation is a private training college for pilots that started training in Greece in July 2006. The facilities of Egnatia Aviation are mostly located in the former passengers' terminal of the Kavala International Airport "Alexander the Great". Kavala hosts a wide array of cultural events, which mostly take place during the summer months. The top festival is the Festival of Philippi which lasts from July to September and includes theatrical performances and music concerts. Since 1957, it has been the city's most important cultural event and one of the most important of Greece. Cosmopolis is an international festival held in the Old Town of Kavala that offers an acquaintance with cultures around the world through dancing and musical groups, traditional national cuisines, cinema, and exhibits at the kiosks of participant countries. The first festival took place in 2000, and from 2002 until 2009 was organised annually. It was revived in 2016 with a participation of 250 artists and musicians from all over the world. Giannis Papaioannou's Festival includes concerts and music seminars. Ilios ke Petra (Sun and Stone) (July) is a festival held in "Akontisma" of Nea Karvali. The event is of folkloric character, with the participation of traditional dancing groups from all over the world. Wood Water Wild Festival is an outdoor activities festival, inspired by nature. It includes live bands and DJ sets, body&mind activities, a book fair, outdoor theatre, ecology, camping, and debates. Kavala AirSea Show is an annual air show held in late June. Various cultural events are held in all municipalities of Kavala during the summer months. Fish and seafood, as well as the products of the local livestock breeding and agricultural sectors are the prevailing elements of Kavala cuisine. In Kavala, the traditional local recipes have been influenced by the cuisine of the refugees from Pontos, Asia Minor and Kappadokia. Fresh fish and seafood, salted food, mackerel "gouna" (sun dried mackerel on the grill), sardine pantremeni, mussels with rice, herring saganaki, anchovies wrapped in grape leaves, and stuffed eggplant are some very renowned recipes in Kavala and the coastal settlements of the region. The grapes, wine and tsipouro produced in the area, as well as the kourabiedes (sugar-coated almond biscuits) from Nea Karvali, are particularly famous. European route E90 runs through the city and connects Kavala with the other cities. The Egnatia Motorway (A2) lies north of the city. One can enter the city from one of two junctions: Kavala West and Kavala East. Kavala has regular connection with Interregional Bus Lines (KTEL) from and to Thessaloniki and Athens. The Kavala International Airport "Alexander the Great" (27 km (17 mi) from Kavala) is connected with Athens by regularly scheduled flights and with many European cities by scheduled and charter flights. Kavala is connected with all the islands of the Northern Aegean Sea with frequent itineraries of various ferry lines. Kavala F.C. : AO Kavala (Greek: Athlitikos Omilos Kavala, Αθλητικός Όμιλος Καβάλα), the Athletic Club Kavala, is a professional association football club based in Kavala. The club plays in the municipal Kavala Stadium "Anthi Karagianni". Kavala B.C. : Enosi Kalathosfairisis Kavalas (Greek: Ένωση Καλαθοσφαίρισης Καβάλας – Basketball Union of Kavala) is a Greek professional basketball club in Kavala. The club is also known as E.K. Kavalas. The club's full Greek name is Ένωση Καλαθοσφαίρισης Καβάλας (Kavala Basketball Union or Kavala Basketball Association). The club competes in the Greek League. Kavala Chess Club: Chess is very popular in Kavala and the local chess club ranks top in Greece, enjoying plenty of success both domestically and internationally. The highlight is the club's annual International Open, which takes place every August in Kavala and attracts the biggest names in chess from all over the globe. Christopolis was important enough in the Late Roman province of Macedonia Secunda to be a suffragan of its capital Philippi's Metropolitan Archbishopric, but the Catholic succession ended. The diocese of Christopolis was nominally restored in 1933 as a Latin Catholic titular bishopric. Austria opened a post office in Kavala before 1864. Between 1893 and 1903, the French post office in the city issued its own postage stamps; at first stamps of France overprinted with "Cavalle" and a value in piasters, then in 1902 the French designs inscribed "CAVALLE". ^ Kiel, Machiel (1971). "Observations on the History of Northern Greece during the Turkish Rule: Historical and Architectural Description of the Turkish Monuments of Komotini and Serres, their place in the Development of Ottoman Turkish Architecture and their Present Condition". Balkan Studies. 12: 416. ^ "EMY-Εθνική Μετεωρολογική Υπηρεσία". Hnms.gr. Retrieved 2013-03-26. Stefanidou Emilia, The City-Port of Kavala during the Period of Turkish Rule. An Urban Survey (1391–1912), Kavala: Historical & Literary Archive of Kavala, 2007 (in Greek). Karagiannakidis Nikos – Likourinos Kyriakos, Neapolis-Christoupolis-Kavala, Kavala: Municipality of Kavala, 2009 (in Greek). Roudometof Nikolaos (ed. ), Notebooks of Bulgarian Occupation. Eastern Macedonia 1916–1918. v. 1, Kavala – Chrisoupoli – Eleutheroupoli, Kavala: Historical & Literary Archive of Kavala (in Greek). 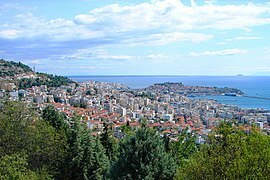 Wikimedia Commons has media related to Kavala. "Kavala" . Encyclopædia Britannica. 15 (11th ed.). 1911. This page was last edited on 17 February 2019, at 16:58 (UTC).